Job openings increased at a slower-than-predicted pace in January as severe winter storms affected the labor market in the Midwest and eastern U.S. The number of open positions increased from 3.91 in January to 3.97 million as hiring fell and the number of Americans quitting their jobs declined. February payrolls beat out January after winter storms depressed hiring. Employment rose by 175,000 in February following 129,000 in January, and 84,000 in December. The unemployment rate ticked up to 6.7 percent in February up from 6.6 percent in January. The number of people hired in January fell to 4.54 million as the hiring rate stagnated at 3.3 percent. Total firings, excluding retirements and voluntary separations, rose from 1.7 million in December 2013 to 1.74 in January. The biggest increases in available employment took place in health care, education, and leisure and hospitality fields while retail and trade, transportation, and utilities industries recorded job declines. For the time between January 2013 and January 2014, the economy created a net 2.2 million jobs, reflecting 54.3 million hires and 52.1 separations. 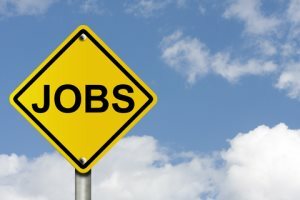 With 10.2 million Americans unemployed, there are approximately 2.6 workers for each open position, up from 1.8 at the beginning of the recession in December 2007.